So let's be honest, how many of you noticed that I had missed the action replay post for March? April passed by so quick, all thanks to the A to Z challenge. It was one hell of a testing month and I feel so proud to have completed the challenge successfully. I had zero posts scheduled and every post was written on that very day. Expect the Z one though. That I had to schedule, as I was travelling on the 30th and had no access to Internet what so ever. This A to Z challenge for 2015 has been very close to my heart as I wrote about a lot of things that are personal to me. I wanted to talk about a lot of issues and thoughts that were plaguing my mind and I managed to include it in my posts during the challenge. Also I managed to write quite a few sponsored posts that gave me some pretty decent additional income. But then again as always, I only chose to write about the topics that I seriously believed in. Now I see that I have more than 30 posts for the month of April. Wow, did I actually manage all of that? Inspite of being packed at work and cooking and baking at home. Well, I don't want to be modest here so I would say that I am extremely proud of myself. I shall start with March first, since it was one of the most important months of this year for me. In terms of happiness and in terms of lessons as well. Cal and I celebrated our second year wedding anniversary on 22nd March and it was an awesome celebration. Two years? Phew! No wonder they say that time flies when spent with the one you love. Cal has been a wonderful husband and the best companion ever. The past two years have been extremely tough, and I could not have got past it without his help. He has been so understanding and helpful that I thank my stars everyday for having him in my life. Also, as planned we moved out to a place of our own before the anniversary and this doubled our celebration. We set up a house from scratch together and it has been one of the most fulfilling experiences of my life. It was just us and nobody else. We bought every item, big and small together from our own hard earned money. This place has given us peace of mind more than anything else. Privacy is an added bonus. As happy as the month has been, it also has been trying for me. A few relationships turned out to be so fake and some people farted out a rainbow as they showed their true colors. Good, it happened. Very good, it happened soon. It took me a while to accept it and get it out of my system, but then soon they were all thrown into the nothing bucket. If given a choice to choose between a broken relationship or a fake one, I would without a doubt choose the former. Being fake is something that I absolutely hate. I am not the sort of person to abuse someone behind their back and talk to them sweetly the next instant. I have the desperate need to have a clear conscience and it is very important to me to be able to look into the mirror and be happy with the person I see in it. Maybe it is just me. April was all about work, blogging and more work. Now that A to Z has been completed I want to start a fiction series soon. I am missing my stories myself, as narcissistic as it sounds. I want to try and keep the momentum of writing as it was in April. Thirty six posts is a good number for a full time working woman like me who even takes care of the house without a maid. I have an ever supporting and helpful husband though who makes it easier for me. However the highlight of April would be my vacation to Goa. As we were busy saving up on money to set up the house, we had to cut down on our vacations. We planned to travel during our anniversary, but the two options were a house or a vacation. And we then thought that the house could be our vacation as well. But now since a couple of months have passed, we were able to plan a five day vacation to our favorite place, Goa! This is our fourth visit to Goa in four years. It is like a yearly ritual for us. Goa has to be visited atleast once a year. This time Goa was more special because my best friend Priya and her husband were also travelling with us. Sixteen years of friendship and this was my first ever vacation with her. Can you believe it? But then again, better late than never right. Goa in April/May was very hot. I came back ten shades darker and with a hundred boils on my face and body. But the vacation was totally worth it. We relaxed, pampered ourselves and explored Goa like never before. Now that Zomato is in Goa, we found a lot of new food places to try out. I ate sea food to my heart's content and let work completely off my mind. I was so over worked that this was such a welcome break for me. We lazed around and did things at our own will. Goa is such a laid back place that it makes you lazy as well. We were all relaxed and rejuvenated by the time we got back to Bangalore. But once the Bangalore weather hits you, you realize that there is no place like Bangalore. Inspite of an early morning flight, I felt so awesome and happy to be back home. We got back home to see that our plants have grown a lot over the past five days. Our orange hibiscus plant had a flower blooming to welcome us. Coming back to the place we have created as home was such a wonderful feeling. Our home, out love nest, our heaven. Vacations do give you the perfect getaway, but when you have a wonderful place for yourself, there is no place like home indeed. Let me know, how did April treat you? We are soul sisters, I tell you. I can't stand fake people either. Shallow people like them deserve no place in our hearts. 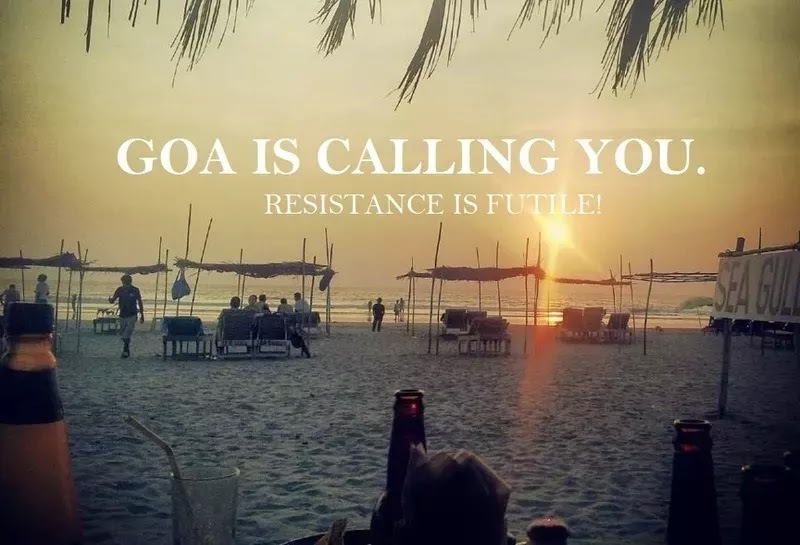 Goa sounds wonderful. Makes me want to visit there soon. Do upload more pictures of your stay. And 36 posts? Way to go, super woman! I went to Goa in March for the first time and I loved every bit of it.. Keeping a clear conscience is difficult but totally worth it.. the same thing happens with me as well.. being too honest gets against me at times but at the end of the day I feel contended with the way I am.. Very well summed up Soumya.. Sounds like you had a wonderful break. I am jealous as we haven't had a break of any kind in a while for various reasons. Your home sounds wonderful too. You should take a break Jo. I enjoyed your AtoZ posts Soumya. Congrats on completing the challenge. And as I always say, how do you manage to write so much?? My April was as hectic as it could get because of shifting in a new house. But nevertheless I managed.